Independent retailers obviously want to encourage the people within their communities to ‘shop local’ and we know that in return we can offer a breadth of quality products, excellent personal service with good and genuine advice and give high streets a sense of vibrancy and uniqueness that gets lost when the same retailers or supermarkets with their generic branding come to dominate towns. How can independent retailers compete with convenience and discounts offered by bigger retailers? However, we realise that supermarkets and big stores have been successful as they can offer a range of products under one roof and, through their size, also offer lower prices than many smaller stores are able to, so how can we even try to compete with the convenience and discounted rates offered by bigger stores? Many independent shops run their own loyalty schemes to encourage repeat custom but these may not appeal to all customers who may use particular shops infrequently, plus if these are for specific retailers they are not encouraging a general shop local approach, just a shop here approach. This isn’t suggesting a wide range of products to consumers and this is where the TAG! Pass it On scheme is different. TAG! Pass it On is a community discount card scheme which aims to encourage people to use all their local shops and services. Local shops and services join the TAG! Pass it On scheme and decide what offer they want to use. 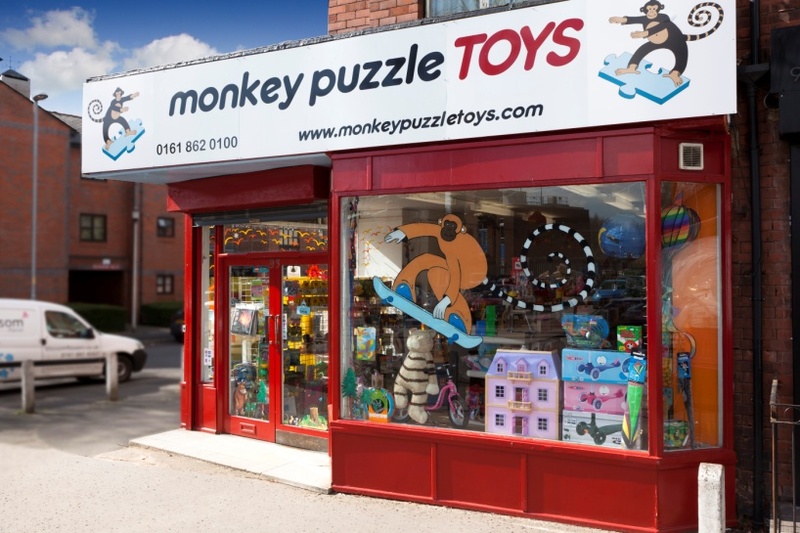 Here in our toy shop, Monkey Puzzle Toys, we give our customers 10% off when they spend over £25. Although obviously this cuts into our margins, which on some of our products are very tight anyway, it does provide an incentive for customers to shop with us and we are even starting to find that customers who have spent in the region of £20 will choose something extra in order to get their discount. The TAG! Cards aren’t free of charge for customers – initially I was worried that this would put people off joining the scheme, but actually, I have found that this is more likely to make people try to remember to use the cards once they’ve bought them as they want to feel they have ‘got their money’s worth’. Having purchased a HI-Life Diners card (in the pre-children years when I had a social life!) I can relate to this as we tried to eat out regularly at restaurants in the scheme so that we felt we had had our money’s worth from our card. The Tag! Cards are £5.00 and as retailers we can sell these and make a little bit of money through selling these too, which is yet another incentive to sell them and get more and more people on board and committed to shopping locally. Our local TAG! Scheme currently includes 57 retailers – which are a mixture of local shops, restaurants, beauty salons, hairdressers, plus services such as photographers, caterers, tradespeople, printers and even a solicitors so there is a great mix of providers available to choose from and certainly more products and services than you could get from any one supermarket. The more retailers and services in the scheme the better incentive for consumers to buy a card so it really does start to snowball once plenty of retailers get on board. We’re very conscious of offering competitive prices in our shop and have worked hard to get a good range of products that are affordable for people in these tough financial times. Also because we are online we have to be competitive if we are to achieve any online sales and we feel strongly that the price we offer online should be duplicated in the shop so that we don’t have a two tier pricing system. We know that approximately 50% of the people who visit our website live with a ten mile radius of our Manchester shop and use the website to check us out before visiting the shop so prices have to be consistent. This does mean that sometimes we simply can’t offer the cheapest price online for a product because we have to take into account a customer using the TAG! Card and getting a discount of 10% off from the selling price. Given that online sales are growing all the time we have worried that we may be sacrificing online sales to be in the scheme, however because our shop sales are currently higher than our online sales this is a risk we’ve had to take. I guess if we were just about shifting units we’d have rented a warehouse and set up Amazon and Ebay accounts, its being part of the local community, the daily interaction with customers and picking products that we know the parents and children who come into our shop will love that gives us a buzz, (though I’d be lying if I said I wouldn’t like to have more online sales too!!) but as the shop is our primary focus, then a scheme that will hopefully increase footfall to our shop and spend whilst here is the current way forward for us. This entry was posted in Independent Retailer Month - Blog-a-day for #IndieRetail and tagged loyalty card, loyalty scheme, monkey puzzle toys, tag pass it on. Bookmark the permalink.